Govanhill Baths Community Trust AGM will be held on Tuesday 25 August at 7pm at the Baths. All current members are entitled to vote but all local people and supporters are welcome to attend. As the Baths refurbishment moves in to the next stage, the reinstatement of two of the three pools; the Turkish baths; and major repairs to the structure of the building; there has never been a more exciting time to get involved with the Trust. 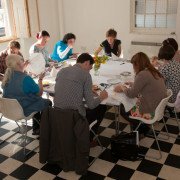 The community hub we set up three years ago is full of local groups and individuals taking part in classes, community groups and meetings. Our community programme is delivering opportunities and new skills to the people of Govanhill and beyond. We are looking for dynamic, enthusiastic and positive individuals who can contribute to the work of the Trust. There are lots of ways to get involved from occassionally volunteering, contributing financially through donations or subscription membership, or just coming along to add your ideas and voice. Our campaign is celebrated across the country as a fine example of a community working together to take ownership and control of vital public assets. You can make a difference. 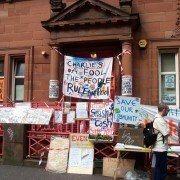 For further details of how to get involved see https://www.govanhillbaths.com/get-involved/ or call Jim Monaghan on 0141 433 2999. 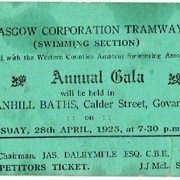 This is the first blog from the Govanhill Baths Archive!!!! First of all we’re in a new space at the Baths – up the stairs in what was formerly the slipper baths and have a lot more room for people to come in and access our collections. On the blog we want to share items and stories from the archive; report on our travels; give news of our development and link to articles, events, websites etc., on all things archive; particularly independent community archives and history from below. A few weeks ago we received a wonderful letter in the post from C. Anderson with a competitor’s ticket to the Annual Gala of 1925. This is fantastic as recently for the Centenary Celebrations exhibition and the United We Will Swim book we had to request digital copies of tickets from Glasgow City Archives, Baths and Wash Houses Collection, so it’s great to have an example here at the Baths for people to access.